There has been much effort by researchers to understand how skeletal muscle repairs itself and which cells are involved in this process. This article summarises a review by researchers in the group of Professor Giulio Cossu from the Stem Cell Research Institute, University of Milan from January 2010. The review discussed the different types of stem cells which could be used to repair muscles; as well as how therapies using these cells might work. There are lots of stem cells in the body, their job is to repair or renew tissues when they are damaged or worn out. These are broadly termed ‘adult or tissue stem cells’ and most tissues have their own reservoir of stem cells that are used to repair or renew that tissue. Satellite cells are thought to be the main muscle-producing stem cell in the adult body. Scientists have worked out techniques to find the satellite cells in muscles and grow them in the laboratory. In the 1980s, scientists showed that injecting satellite cells into a mouse with a Duchenne muscular dystrophy-like disease could start dystrophin (the protein missing in Duchenne muscular dystrophy) production. In 1990, satellite cells were injected into the muscle fibres of a 9 year old boy with Duchenne muscular dystrophy. The results showed that the procedure was safe and that dystrophin was produced. When the procedure was repeated in 11 patients, researchers could see a positive effect in the single muscle fibres they injected, but not in the muscles as a whole. One way of reducing immune rejection is to use a patient’s own cells, however this is not possible for people with Duchenne muscular dystrophy as all their cells contain the mutation in the dystrophin gene. For other conditions this is an option, for example using a patient’s own satellite cells to treat the muscle damage associated with heart failure. In these trial treatments, patients’ satellite cells are grown in the laboratory and transplanted back into the patient. Studies have shown they can improve heart function without being rejected. However, the cells did not develop into the expected cardiomyocytes – the cells forming the beating muscle tissue in the heart – showing that controlling development of transplanted cells is not straightforward. Further studies will aim to address the issues of rejection and controlling the cells. However the problem of the number of injections needed to get the cells to the right place will continue to be an issue for satellite cell therapy. Other stem cell types have also been investigated as possible treatments for Duchenne muscular dystrophy. Of particular interest are a type of stem cell usually found in blood vessel walls – called mesoangioblasts. These cells are able to move through the blood to the muscles and can produce muscle fibres, a significant advantage over satellite cells. The cells grow well in the laboratory, outside the body, and this may be of use in proposed treatments for Duchenne muscular dystrophy which aim to repair mutations in the dystrophin gene. The cells would then be able to produce dystrophin to repair the damaged muscles – something achieved in animal models using this system. Some blood stem cells have also shown promising results – in particular, blood stem cells which produce a protein called CD133 (called CD133+ cells). These cells can help to repair muscle tissue and restore muscle function in mice. They may also have therapeutic potential in Duchenne muscular dystrophy. One study showed that that it was possible to correct the mutation in the dystrophin gene – these genetically corrected CD133+ cells could promote the recovery of muscles and improved muscle function in a mouse model. Early clinical trials have suggested it is safe to transplant CD133+ cells into children with Duchenne muscular dystrophy. Studies are also planned to test the safety of mesoangioblasts as a potential stem cell therapy for Duchenne muscular dystrophy. Immune reject remains an issue if donor cells used. However there are also significant safety issues connected with using a patient’s own genetically corrected cells. Particularly with the technique used to genetically change the cells. Work in these systems is still at a very early stage but shows some promise without some of the problems associated with using satellite cells. Pluripotent stem cells are cells which can give rise to every cell in the body. These cells are important during development where they are responsible for construction of all tissues and organs of a human body. The ability to form different tissues means these cells have good therapeutic potential – they could be used to treat a wide range of tissue damage. There are two main types of pluripotent stem cell: embryonic stem cells and induced pluripotent stem cells. Embryonic stem cells, as their name suggests are isolated from embryos. Several studies in the mid-1990s showed that these cells formed three dimensional structures when grown outside the body. 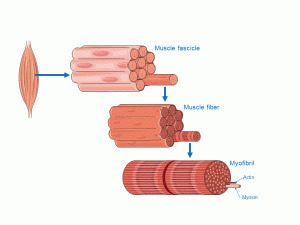 These structures contained muscle fibres that were similar to skeletal muscle and cells similar to satellite cells. Induced pluripotent stem cells are generated in the laboratory. Mature cells are taken from the body and grown in a cocktail of chemicals to produce cells which behave like pluripotent cells. These cells have great potential but there is little evidence yet that induced pluripotent stem cells can be directed to form satellite cells and generate muscle tissue. However it is likely that protocols will appear in the near future as induced pluripotent cells are a current focus of stem research. There are issues with using pluripotent stem cells that are common to therapies using tissue or adult stem cells – such as immune rejection, cell survival and controlling how cells behave. As mentioned previously immune rejection could be combatted by using a patient’s own cells, in the case of Duchenne muscular dystrophy that would involve genetically correcting the cells. However pluripotent stem cells also bring a risk of uncontrolled cell growth and tumour formation. Scientists need to be able to filter out the stem cells which still have an uncontrolled ability to grow and divide (tumour causing cells) from those which have already committed to becoming a certain subset of cells (such as satellite cells). One of the key developments required for this research to be taken forward as a clinical therapy will be the development of techniques to remove tumour-causing cells. The authors conclude by suggesting that the evidence from current research is that mesoangioblasts and genetically corrected induced pluripotent stem cells will be the best candidates for cell therapy of muscular dystrophy. The scientific summary of the original paper can be found here. The full original paper was published in the Journal of Clinical Investigation in January 2010. It can be found here (subscription may be required).